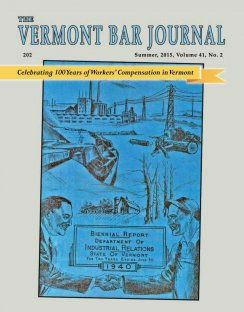 VERMONT WORKERS' COMPENSATION UPDATE OCTOBER TO DECEMBER 2017 - McCormick, Fitzpatrick, Kasper, and Burchard, P.C. Diamond v. Burlington Free Press, 2017 VT 93 (Oct. 6, 2017). Reversed Commissioner’s opinion finding no bar to claim for additional permanent impairment as claim not a time barred modification of 2004 PPD award as original Form 22 did not cover new impairment. “Barring the claim based merely on the generic reference to claimant’s ‘cervical spine’ ignores a material portion of the agreement -namely, the medical report upon which it was based – and is the sort of ‘medieval literalism’ we have warned against in previous workers’ compensation cases.” Court also dismisses Employer’s argument that allowing claim “will lead to potentially endless liability for employers” citing to limited liability protections in the Act and the Employer’s ongoing liability for medical benefits regardless of any bar to additional permanency benefits. Brosam v United Parcel Service, Opinion No. 14-17WC (Oct. 20, 2017)(ALJ Phillips). Vohnoutka v Ronnie=s Cycle Sales of Bennington Inc., Opinion No. 16-17WC (Dec. 8, 2017)(ALJ Phillips). Claimant’s claim for mental injury denied. “The evidence here does not establish a causal relationship between Claimant’s work stress and her psychological condition. Accordingly whether analyzed as a physical-mental claim or a mental-mental claim, her claim fails in either event. Moreover, even if she had established a causal relationship, she has also failed to prove that her work stress was extraordinary when compared to similarly situated employees performing the same or similar work.” 2017 amendment to statute changing standard for mental-mental injuries not applied as a substantive change in the law and the injury herein occurred prior to the change in the statute.